A perfect no bake Mango Cheesecake made from scratch. This cold cheesecake succeeds every time and it’s almost too easy! Fresh Mangoes turned into a puree and added to the cream cheese mixture. The base is prepared out of crushed cookies and butter and hold together firmly. You can watch the whole video further below on how to make this delicious mango cheesecake. 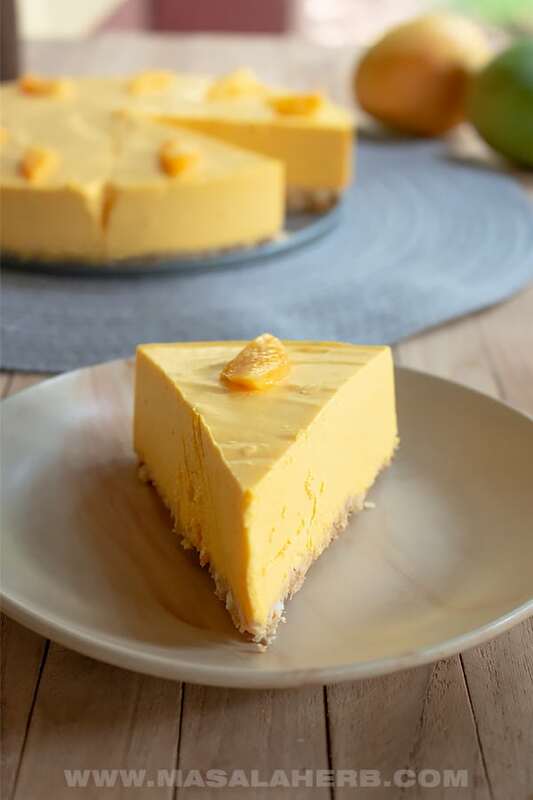 To make this no bake mango cheesecake you will need some basic ingredients. The base is made out of butter cookies crushed and mixed with molten butter. Then it’s flattened and left to cool. That way the base will remain firm and will be able to hold the rest of the filling during the setting time. You can use other variations of cookies such as coconut cookies or similar. I like to keep it basic. For the cream cheese no bake filling you will need regular cream cheese, whipped cream, sugar and mango pulp. 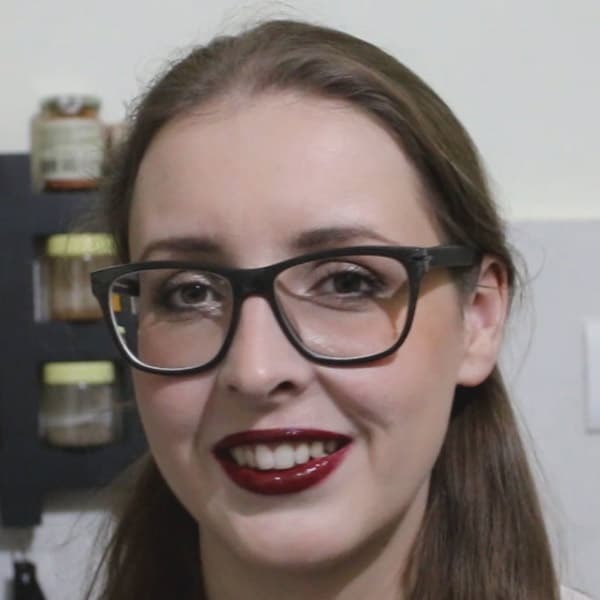 The cream cheese should be clear, the whipped cream needs to be above 45% fats to turn into a lovely whipped consistency which will give the no bake cheesecake the fluff it needs. For the Mango, I used a variation close to Alphonso. Those mangoes were rather small so I used about two and turned the mango into a pulpy puree. You can also use mango pulp directly if you have that in your freezer. I used powdered sugar because it’s easier to mix it in and I suggest you do the same thing. So much easier and you will finish faster! I also use gelatin but the gelatin sheets from dr. oetkar because those always turned my desserts perfect. I mentioned the gram and ounces in the recipe card below so you can use gelatin granules too if you prefer. You can also use Agar Agar to make this vegetarian. I don’t like the taste of agar agar and I don’t think it sets as well as regular gelatin. These are the only ingredients that you need to make this no-bake mango cheesecake recipe from scratch. 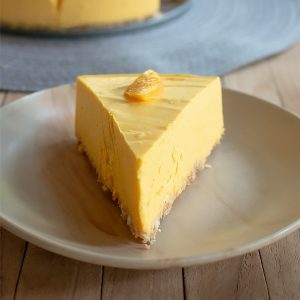 How to make Mango Cheesecake? The process is rather simple. First prepare the cookie base, secondly the cheesecake filling. add sugar, cream cheese, and mango pulp. add some of the cream cheese filling to the hot gelatin to temper, mix well. Mix all the tempered gelatin into the remaining cream cheese filling. Useful tools to make Mango Cheesecake from scratch at home. The main item for the cheesecake is an 8 inch Spring form. You will need this to prepare the no bake cheesecake. The springform opens up from the sides and you can remove the cake, as shown in the video so that the cake sits at the bottom springform plate without having been damaged. The easiest way to prepare the mango cheesecake base is by smashing the cookies in a ziplock bag. To prepare the cheesecake dough from scratch make sure that you have your mixing bowls ready with the handy spatula. These are basic kitchen tools. I always use an electronic weight scale because I think in grams to keep my ingredients ready before I start out. The great thing is that these scales come with grams and ounces indication. To pulp the Mango I use either A, previously prepared Mango Pulp or B, blend some fresh Mangoes in a powerful hand blender with jar. And of course, to simplify things, a hand mixer is a godsend when whipping up the cream. Super Creamy and light Mango Cheesecake with fresh Mangoes. Love this cake during the hotter days of the year. Keep in the fridge to cool for 12 hours and then enjoy each slice before somebody else finishes your cake! We will start out with the base. Place your cookies in a ziplock bag and close the bag. Smash the cookies into tiny crumbles by rolling with a rolling pin over the cookies. Pour the crumbled cookies into your springform shape and spread out by making a mold in the center. Pour the molten butter into it and start mixing everything. Do that until the cookie crumbles and butter have become one crumble dough like base. Flatten into the mold so that it's evenly covering to form the base. Place the springform with the cookie base into the fridge for at least 30 minutes so that the base hardens. In the meanwhile prepare your cream cheese mango filling by whipping the cream cheese first fluffy. Then add the sugar, cream cheese, and mango pulp and mix it all well into the mass. Add your gelatin into the water and let soak until soft. Take to the heat and allow the gelatin to melt. Once the gelatin is completely dissolved, take our cream cheese mango mass and add some of it into the still hot gelatin to temper the gelatin. Mix well. Pour the gelatin mixture into the mango cheesecake mass and mix the whole content. Get your springform with the cookie base and pour the mango cheesecake filling into the springform. Place in the fridge and let cool and set for 12 hours. Take out after it has set and carefully remove from springform. Cut into slices and serve cold. You can use some mango bits to decorate your cheesecake. As Gelatin I use the Dr. Oetker sheets. Those are foolproof and they are pretty much the only brand which I use anywhere in the world for my gelatin dishes. Dear Reader, what time of the day do you like to eat your cheesecake? 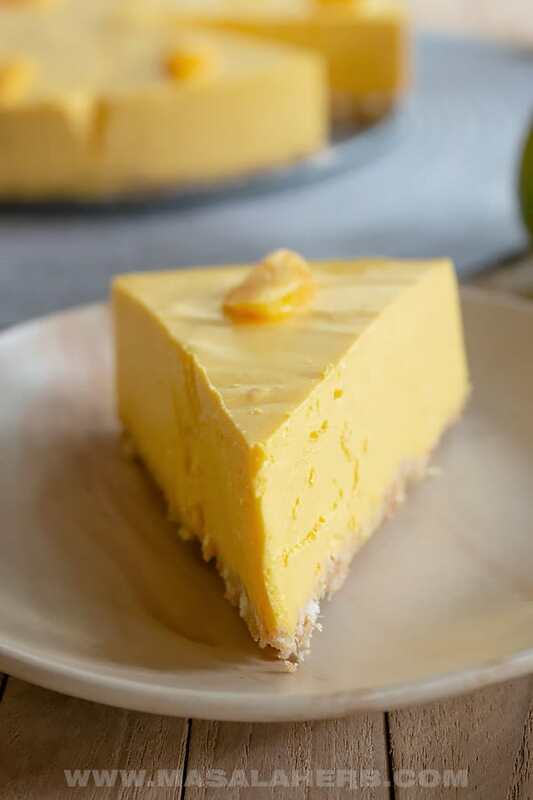 I am usually not a big fan of no bake cheesecakes, I just find them way to creamy and rich, I like the dryer texture of baked cheesecakes, but I must say, this one looks so delicious! The mango purée must give it a beautiful flavour without it being too sweet. The colour is awesome. So decadent and delicious. Have 5 ripe mangoes in our refrigerator right now. Even a few extra for garnishes. Perfect recipe for the summer and we don’t even have to turn on the oven. This delicious mango cheesecake is packed with tropical flavor! The best part? This easy no-bake recipe was quick and simple to make. This recipe’s a keeper! I only have a 9 inch springform, how could I convert this recipe to fit that instead? 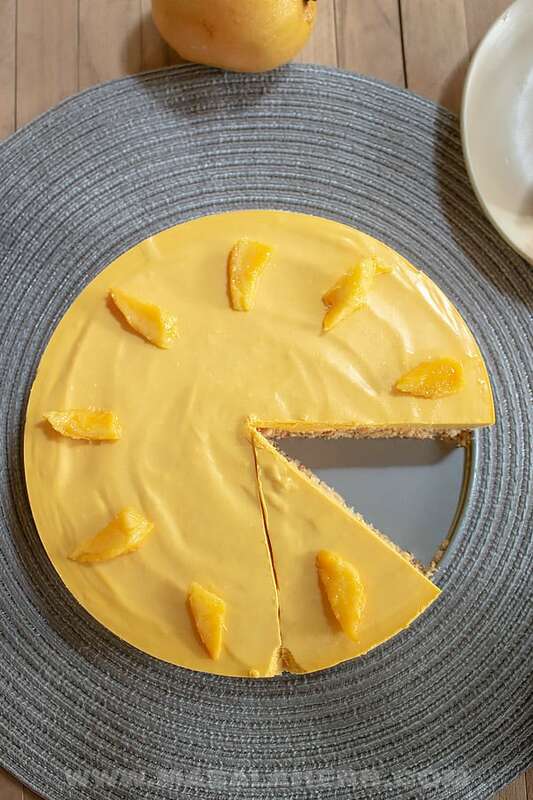 Meg, to make this mango cheesecake in a 9-inch instead of an 8-inch springform you will need to increase each ingredient by about 20%. You can find more detailed instructions on this website. 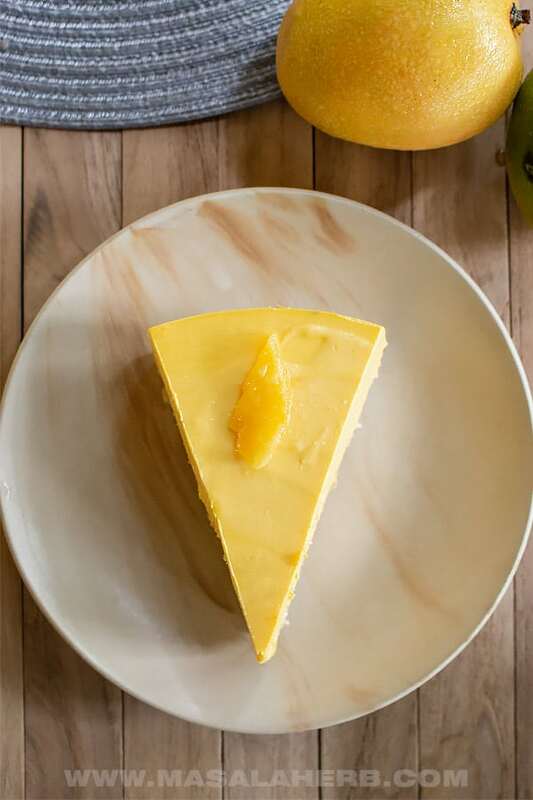 Hi, this may be interesting you: How to make Mango Cheesecake [No Bake Recipe]!